This score engages black women in exploring their childhood ideals of beauty through the processes of hairbraiding and jumping rope. Black hairbraiders and women who know who to turn rope work together to create living interactive sculptures using their own bodies. 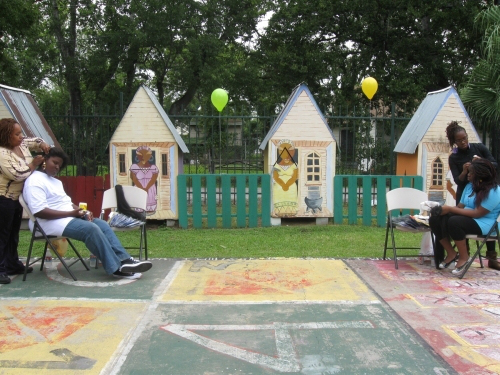 Project Row Houses. Houston, TX. 2009. Corner of Monroe and Bedford Streets. Brooklyn, NY. 2009. The Kitchen Block Party. New York, NY. 2009. First Saturday. Brooklyn Museum. Brooklyn, NY. 2009. The first player to jump and rhyme through the entire alphabet from A-Z wins. Special commission for Derrick Adam's Go Stand Next to The Mountain. The Kitchen. New York, NY. 2010. Fun Fact: Cousins did not know how to braid hair extensions or turn double dutch when she composed this score. She just recognized that these were the methods used to create what black women around her considered to be the most beautiful expressions of hair design and physical agility.